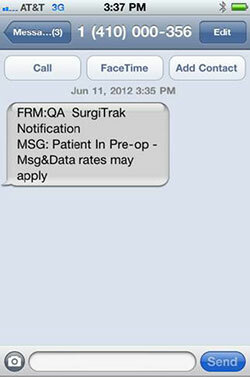 SurgiTrak is a way of sending updates to your family members and friends on your status as you move through pre-op to surgery to recovery. These updates are sent via text message or email to a mobile device such as a smart phone, tablet, or any other computer or laptop with an internet connection. 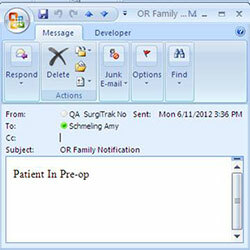 Your family and friends get information about your surgery, no matter where they are. For family members and friends who are waiting for you at the hospital, SurgiTrak gives them the freedom to leave the waiting area without the worry of missing important updates on how you’re doing. With your permission, a SurgiTrak invitation will be emailed to you sometime within a week of your date of surgery. 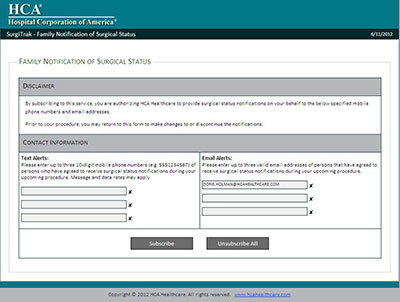 The email will give you a link to an enrollment form that you can use to enter the mobile phone numbers and/or email addresses of those who have agreed to get updates from us during your surgery. To sign up, all you need to do is tell a registration representative you want to enroll in SurgiTrak, and give your email address so the invitation can be sent. This enrollment will only be used for this surgery. All patients not already admitted and scheduled for surgery in our main operating room are eligible for the SurgiTrak program.